Spectacular Gulf views from your 11th floor condo in Sanibel Harbour. Watch sunsets every night on your furnished screened-in balcony with no shortage of photo opportunities of breathtaking scenery and purple skies. 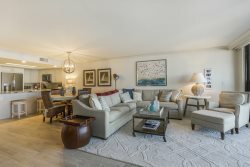 Like all our Sanibel Harbour condos on the Gulf shores, this unit is well-appointed with a delightful palate of neutral, cranberry, dark yellow and green tones to make up an appealing Florida-style decor. Equipped with newer appliances, furniture, and crown molding throughout. There is a TV in the living room and both bedrooms, and at least one DVD player. Enjoy a meal on your furnished balcony while watching for dolphins in the water below! King bed in the master and two twins in the guest bedroom. Walk-in closet and separate soaking tub in the master bath. Sleeper sofa in the living room. Sleeps 6 people. You may have found this rental on HomeAway 4363883, HA ID 4363883, VRBO 4363883ha or Vacation Rentals 4363883. Our 5th time there, we have stayed in a variety of units. The standard category has been sufficient. Although the unit needs updating, the overall property, the location and the view more than make up for it.